It is February already; I’m a little late to post this information. 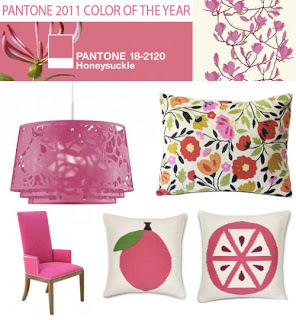 By the way, for you that haven’t yet known, Pantone Color Institute has announced Honeysuckle (Pantone 18-2120), a reddish pink hue, as its 2011 Color of the Year. Honeysuckle relocates Turquoise, 2010’s anointed color. In a press release, Pantone Color Institute mentioned Honeysuckle as "a brave new color for a brave new world." Honeysuckle will look good on our walls, and it will also convey the confidence we need to "meet life's ongoing challenges." In times of stress, we need something to raise our spirits. Honeysuckle is a captivating, stimulating color that gets the adrenaline going – perfect to fight off the blues. 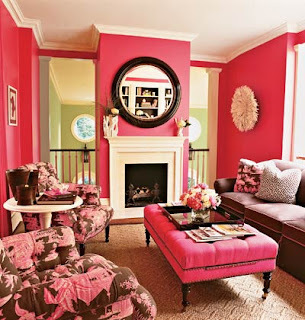 Do you like this color? If you prefer to catch Honeysuckle into your home decoration; you can add little touches of Honeysuckle to your home. See the images for your inspiration.